The lowest price of Nikon D5300 with (AF-S 18-140 mm VR Lens) DSLR Camera ( Black ) is at Amazon where is it is for INR 32429. This price is INR 33800 lower than the other price for the product. The prices for the product change across variants. The price for Nikon D5300 with (AF-S 18-140 mm VR Lens) DSLR Camera ( Black ) is valid across Bangalore, Hyderabad, Chennai, Mumbai, Delhi, Pune and Kolkata. 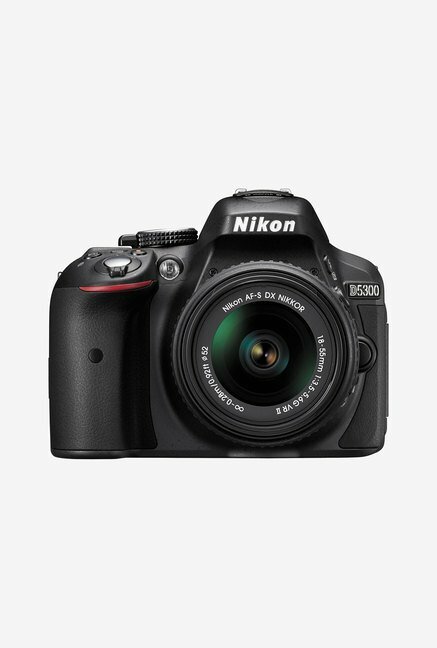 The Nikon D5300 with (AF-S 18-140 mm VR Lens) DSLR Camera ( Black ) is available at best price of INR 32429 on Amazon. (THIS REVIEW IS INSANELY LONG, PLZ BEAR WITH THE LENGTH FOR COOLNESS OF THE CONTENT!) I bought Nikon D5300 after advice from my friends at my college's photography club and using a friend's D5200. I read reviews online and found that this was the camera for me and I didn't overspend on D7100 instead for just a weather proofing and faster burst. Camera and lens are separately review, but the combination is Made for each other! A.CAMERA Pros 1.Very low noise 2.Great battery life 3.Conveiniently designed controls 4.Quick Focusing 5.Compact but grippy 6.Bright and sharp display Cons 1.A bit front heavy with 18-140 lens 2.Camera bag should have been high density polyester instead of cheapo rexine. Review This is an excellent camera to learn photography and suitable for most people who don't click professionally. The low light performance is amazing for a DX sensor! At ISO 1600, the pictures are free of noise (unless you zoom to 100% and do nitpicking) . Even at ISO 3200 you wont need to process them much unless you are printing them, ISO 6400 files are also usable with noise reduction processing. All the modes work as expected.I would advise you to keep eV to +0.3 on Nikons and -0.3 on Canons for optimal result.The camera catches focus pretty fast due to it's 39 point AF system.I prefer to use only 9 cross type points for ease of use. Battery life is good, I clicked 400+ shots without flash and it didn't drop a bar! Nikon's estimate of 600+ shots seems valid.In short if you have access to power supply during your night stay, you won't need an extra battery mid day. Auto mode also works well and is good enough for people who can click only with a phone or point and shoot.My friends(esp girls!) get a sense of accomplishment after clicking a photo using D5300 as they think NOW I CAN USE A DSLR :D ! I think above is enough for me say about it, technical details can be found on review websites, personal experience here! B.LENS Pros 1.18-140mm is most versatile lens, you wont miss any shot just because you couldnt zoom enough or go wide enough 2.Does away the need of changing lens frequently for zooming in. (You wont be exposing your sensor to dust!) 3.VR is great(true 4 stops VR!) 4.Durable with a metal mount and SOLID feel 5.Zoom ring is stiff to prevent accidental change of focal length 6.Decent bokeh at 140mm Cons 1.A bit heavy, but all quality zoom lenses are! 2.Narrow focusing ring 3.The VR On-off and AF-M buttons don't have to good FEEL 18-140 VR lens is an awesome kit lens! The wide focal range let's you click 99% of shots and is a perfect all purpose lens unless you are a wildlife photographer. At 140mm it's zoom is 8x which is what good point and shoots have. 3x of a 18-55 is pretty much useless you don't have a tele lens in your kit. The lens is tack sharp at both ends of it's focal length, a rare quality as most tele or multi purpose lens soften at their higher end.At 140mm the bokeh is good enough to bring a pro feel to your shots, but you have to stand faaar from subject. It does have barrel effect and pincushioning as well as a little chromatic abberation. These can be corrected in lens profile correction option of Camera RAW or within the camera(Yet to test that). VR is amongst the best! According to review sites it's true 4 stop VR vs 2-3 stop for most lens. Personally , I was able to easily click handheld at 1/6 which ain't manageable without being insanely still on average lens. Overall this is a pretty versatile lens and the perfect kit lens for someone going beyond family photos due to it's wide focal range and versatility. For travel it's really great as you won't be changing lens every now and then. DO BUY A HOOD AND FILTER, THEY REALLY HELP! Please go for 18-140mm kit instead of 18-55 only or 18-55+200mm , you will be really satisfied. Other addition to this great lens will be a 35mm or 50 mm prime. PS:If you are serious about wildlife or clicking sports at a high zoom, get a 70-300 or better tele with VR or stablisation, it really more than makes up for triple cost vs a reglar tele. Thanks for your patience ! Hit like if I helped you, your likes more than make up for the time I spent writing this. Bought 18-140 kit after a thorough research. as WS retailer was not the seller on flipkart , bought from elsewhere. You should be knowing that 18-55 is tagged as bad lens when compared with 18-140. Moreover, would you prefer having multiple lens like 18-55, 55-200 etc in your kit and then change them now and then for varied shots? this sounds really stupid as most likely you are not a pro who carries primes and zooms and macros separately. D5300 with 18-140 VR is a perfect solutions for most of your shooting needs. It gives a decent bokeh and manual focus is pretty good. Images are sharp and well exposed. Just that lens is heavy like other DSLR lens. My kit is D5300, 18-140 Vr , 1 extra battery, 32Gb Sandisk SDHC 45 mbps card. Advise you to have a similar kit and add primes with time. As you evolve in a photographer you would realize 'Auto' is not a mode for this camera, A good shot is everywhere, you only need an eye to find it. 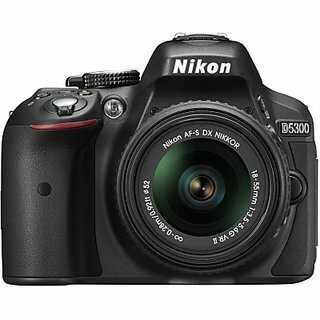 D5300 is your pupil and 18-140 your retina..Go shoot it!! STUNNINGLY GOOD ! 18-140mm is a do-everything lens, definitely a right choice. No, I'm not a professional photographer. No, I'm not a semi-pro photographer either. I just click beautiful pics when I hang out. I bought this after a dig deep research to gift my husband. I didn’t wanted him to drag around 5 lbs of equipment and hence the choice 18-140 mm VS with D5300. This Nikon baby has everything I want/ever need. Overall, this is an excellent camera for hobbyists. The camera performs very well in most shooting situations (except action in low light). If you're reading this, chances are you are like me, a hobbyist, and this camera is all you need. Reviews.. (1) Picture quality is top notch. (2) Low light performance is awesomazing. No noise at all. Maybe if you're a professional photographer, you'll see it. But for me, the pics are perfect and Focus is extremely fast, even in low light. (3) If you want a walk around lens, get the 18-140 mm. It's an excellent one. Sharp, quick focus, light weight, and reasonable price. Since the camera performs very well at high ISO, you don't need really larger aperture (f2.8 or f.18). The lens also has VR - vibration reduction which is a very nice feature. (4) Camera is light even with the 18-140 lens. (5) The grip is a bit small. Bigger cameras (like D7100) have better grip, but also weigh a lot more. (6) No touch screen. However, most of the times, we shoot in P mode, and we are not a pro photographers, so we don't need to change settings a lot. (7) Videos quality is very good. However, it's not silent. The lens creates noise when focusing. The D5300 has most functions of a professional DSLR, although some of these need to be accessed only through the 'menu' (instead of dedicated buttons). However, that is a small inconvenience as the camera body is small and light as compared to the really big DSLRs. The 18-140 mm lens gives excellent results and the auto focus is really fast. Though the DX format sensor is about half the size of a full frame sensor, the results are extremely good. The faster shutter speeds are fantastic. On the whole the camera and lens is a very good combination. A minor grumble : The 'free' bag which came with the package was a bit of a disappointment as it was not up to Nikon's usual high standard :P Happy shopping.. Cheers! !